Sometimes great things can be achieved in the strangest of places. We met each other at a local gym, and one day while changing in the locker room, were lamenting about changes and disappointments that we were experiencing with our personal workouts. Our workouts were feeling more geared to the 180 pound male, rather than to the unique physical needs of a women’s body. The light bulb went off. How about a women’s fitness center that combined top notch training, education about women’s issues, and the opportunity to meet and maintain friendships? The more we talked, the more excited we became. The idea was so compelling to us both that we exchanged emails and met for coffee many more times to continue the conversation. We came to realize that we shared a similar vision to create a place that encourages, supports and pushes women to reach and maintain their physical goals, while enhancing their emotional and social wellbeing. We created Artemis to fulfill needs that we personally experienced and to meet needs we heard expressed by all the women in our lives, at their various ages and stages in life. We take the needs of our members seriously and know that we have an obligation to listen to what our members are saying. We welcome you to Artemis Fitness and hope you find it an enriching part of your day. Artemis is one of the great divinities of the Greeks. Her lineage includes being the daughter of Leto and Zeus (ruler of all of the gods) and twin sister to the god Apollo. 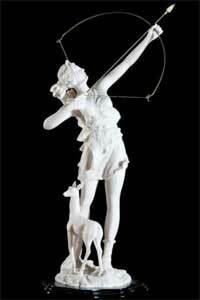 Artemis is considered to be the goddess of the hunt, fertility and childbirth, and the moon. She is depicted as a woman of courage, confidence, and strength who protected and aided women, children, and small animals. The Temple of Artemis is located in Ephesus, which is in the western part of Turkey. The temple is one of the Seven Wonders of the Ancient World. Next time you come in to Artemis, take a look at the small white statute on our front desk. A friend visiting Ephesus last spring brought it back for us and she stands proudly greeting each of you every day!